The morning sky seems painted with pink cotton candy colored clouds. A wispy smoke like layer of fog drifts over the river as I sip my steamy cup of coffee. Winter mornings bring back visions of fields covered in a white blanket of snow, glistening in the morning sun. The crunch of boots on the snow covered ground and frosty breath are memories I cherish. But only in my mind. We don’t have any of that in Florida for the most part except on rare occasions. The only “snow” I see is the white glistening sun on the wings of Snowy Egrets, that are becoming more and more frequent sojourners on the river. Four wrinkled headed Wood Storks are on the neighbor’s pier early this morning. Old Man River, the venerable Great Blue Heron, squawks his usual protest and flies to his pier retreat as I step out on the porch to observe the storks. I see some of the smaller migrating birds, a Bluebird and an Eastern Phoebe sitting on top of the Bald Cyprus we call “The General”. The storks begin to preen and stretch like old men and women getting up from bed in the morning. I watch them leisurely prepare for their morning flight from my dockside chair. They stretch a leg, then a wing. Soon they relieve themselves, a sure sign they are about to fly. Then one by one they step to the edge of the pier, raise their wings and slowly glide off to feed somewhere up the river. I gingerly make my way up the neighbor’s pier after their departure avoiding the white splotches on the decking. There to greet me is my Tricolored Heron friend hunting for minnows. A pair of royal terns fly overhead also on the hunt for breakfast fare. And so it begins. A busy winter morning for the birds of the Broward . A smoke like layer of fog rises over the water this winter morning on the Broward. 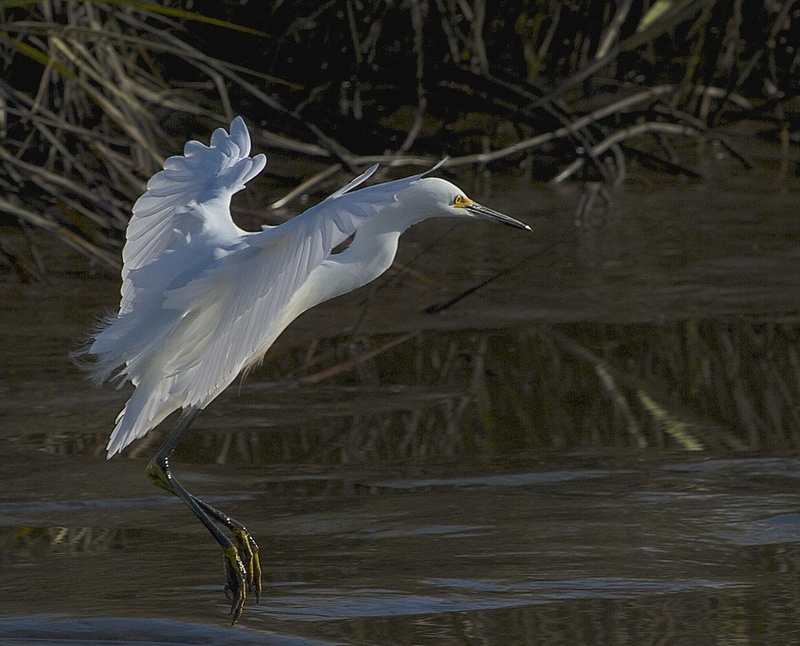 The sun reflecting on a Snowy Egrets wings is the only "snow" I see. 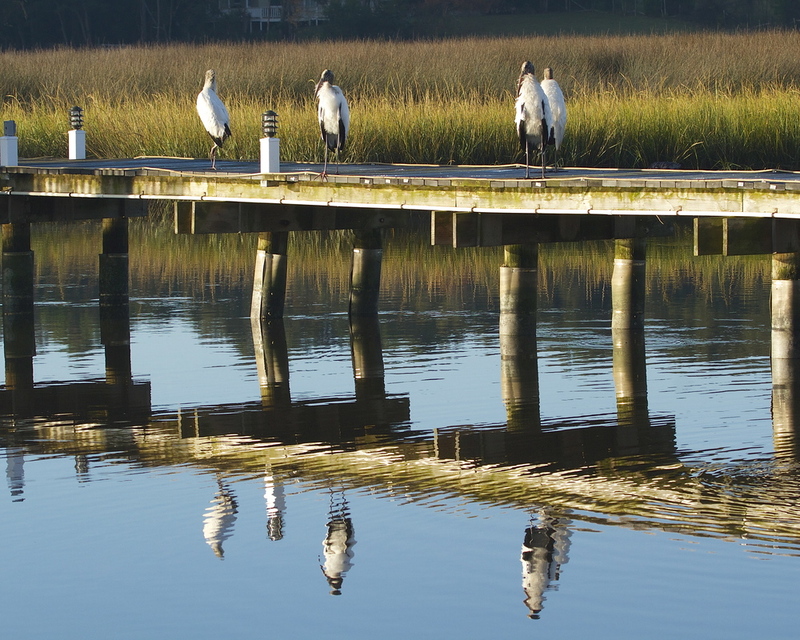 Four wrinkle headed Wood Storks greet the morning light on the neighbor's pier. Ho Hum...is it time to get moving? Time to stretch those legs and wings! OK, who goes first? Looks like someone already went! There went Joe!. Three more to go! There goes Lou, then there were two! TIme, tide and formation wait for none, then there was one. Hey you three, wait up for me! And away they go, flying low and slow! 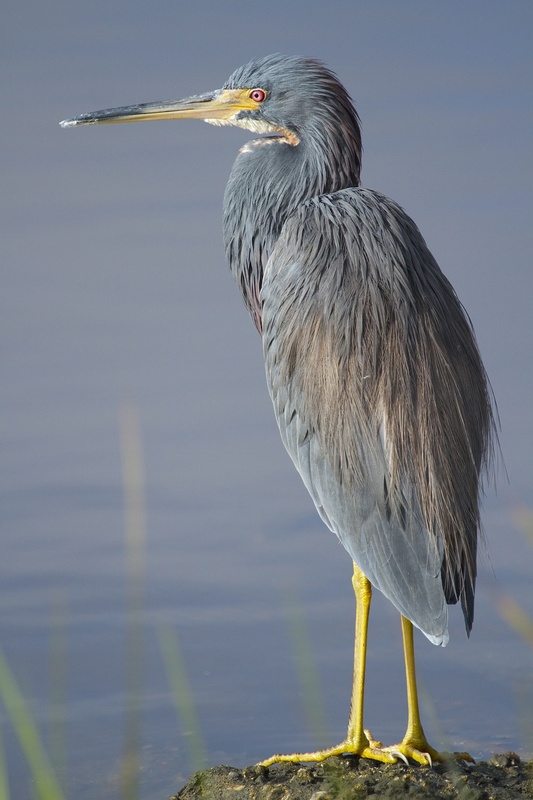 Bout time you got up the Tricolored Heron seems to say. The early bird catches the minnows ya know! The Bluebird eyes me from the top of the General. A migrating Eastern Phoebe keeps an eye on me. A royal tern hunts for breakfast on this fine winter morning on the Broward. See ya next week!